Telling people you are vegetarian in Jordan might get you a few confused looks from the locals. However, that doesn’t mean there aren’t any options for vegetarian travellers and locals. And there are vegetarians: A 2005 survey of Jordanian students aged between 17-28 found that 23.9 per cent were vegetarian. Jordan is historically part of the Levant region that covers a large area in the eastern Mediterranean. Therefore much of its food is a mix of Levantine and Ottoman cuisine, left over from the Turkish-Ottoman empire. It is not uncommon to see vendors walking through the streets of Amman with a pile of kaek and boiled eggs balanced on their head. Mealtime in the country will almost always include a main meat dish; occasionally the national dish mansaf, which is lamb on a bed of rice with jameed, a local yoghurt dressing. But Levantine cuisine also has rich tradition of vegetarian dishes. Vegetarianism has never been a foreign concept in Islam as the Islamic scholar and author, Sheik Hamza Yusuf, told an audience at a lecture in 2011 at the Fair Trade Commerce for a Better World in Canada. He stressed that vegetarianism is supported in Islam and was probably the diet of the Prophet. Here is a guide to some of the vegetarian food you could try when visiting the area. Found in every part of the country these small delights are a staple in Jordan and the Middle East. The falafel is the quintessential street food of the region and is made with crushed chickpeas, parsley, and sesame seeds, with a blend of cumin and coriander spices. Often they are made right in front of your eyes, as local cooks shape the raw mixture then drop it into a large vat of hot oil. This creates a perfectly crispy outer layer while the inside stays melt-in-your-mouth soft. Having to sometimes do hundreds in a night, street falafel makers can form and cook them at such a rapid rate it can be worth ordering just for the spectacle. Served in a warm wrap stuffed with tomato, pickles, and falafel, drizzled with tahini, it’s the perfect quick and easy meal when travelling. Al-Quds in downtown Amman is famous for its take on the delicacy, but falafel is also available from street market stalls, where you may even find the Jordanian specialty, tomato or onion stuffed falafel. Mezze is a food experience. Made up of small plates of dips and salads, usually served at the beginning of a meal, but can be a main in itself. It is usually entirely plant-based, and so lavish you may forget it is supposed to be an entrée. The centrepiece and most famous dish is hummus (find some of our favourite recipes here). Dating back to 13th-century Egypt and famous all over the world, it is usually considered simply a side, but covered in chickpeas, olive oil, and green chilli, it’s filling enough on its own. 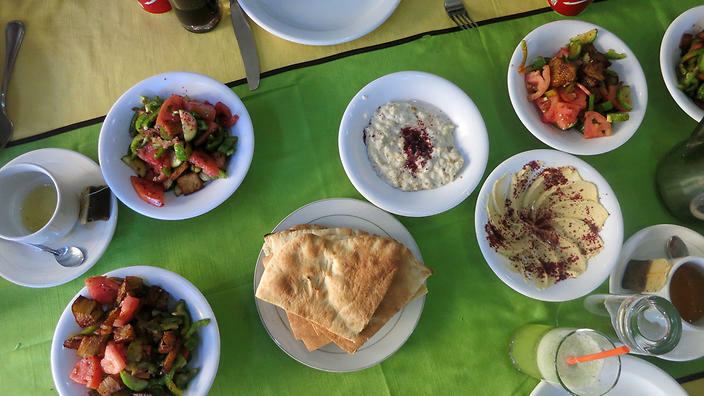 Other mezze dips include moutabel, a mixture of roast eggplant, lemon and yoghurt; and foul, which is mashed fava beans, served with olive oil, garlic and herbs. The salads are where you will find the most vibrant colours and freshest ingredients in Jordanian food. Dressed in only olive oil or lemon, they are not only tasty, but also a healthy option for those looking to avoid the unhealthy holiday diet. From the rich green of tabbouleh, to the crunch of the fried pita bread when you bite into fattoush, Arabic salads are a testament to all-natural flavours and simplicity. Hashem restaurant in central Amman is legendary for its mezza, and as they’ll tell you, even the King of Jordan is a fan. It is also completely vegetarian. As Amman local Ghassan Hammad will tell you, Jordanians love their bread. He says people “demonstrate a few times if you raise gas prices, but if you raise bread prices, they burn the buildings”. Hammad shops at a traditional bakery called Salaheddin. It’s been open for 60 years and just sells kaek, the popular long oval-shaped loaf covered in sesame seeds. It is not uncommon to see vendors walking through the streets of Amman with a pile of kaek and boiled eggs balanced on their head, calling out to potential buyers. At Salaheddin, patrons can fill their own kaek with eggs, chilli, cheese, and the spice blend za’atar. They take their handmade sandwich up to the counter and hand over a couple of dinars. Hammad says it’s a system that hasn’t changed since the day the store opened.